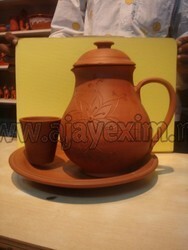 Beautiful Handmade clay water pitcher in an orangish red color. This is a fire clay jug with lid. 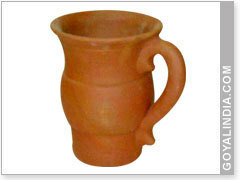 Leveraging the skills of our qualified team of professionals, we are instrumental in offering a wide range of Pottery Jug. It cools down water naturally According to scientists, storing water in a matka is the best way of storing and cooling it. Clay pots provide healingbenefits along with cooling the water down. Item No-46260 , Material Used Clay finish natural item size - 7.25"